Even during winter, Chef Sho Kamio, of Berkeley, California’s Iyasare restaurant, cooks this rich dish, also known as nasu-miso, on the grill, which results in eggplant with wonderfully crispy skin and juicy, tender sweet miso-coated flesh. We’ve adjusted the recipe so you can roast it with equally luscious results for an amazing gluten free side dish. Find shiso leaves at Japanese markets. In a saucepan over medium heat, bring the mirin and sake to a simmer, then cook for 30 seconds to burn off the alcohol. Stir in the miso and sugar until the sugar is dissolved. Remove the sauce from the heat and set aside. Preheat the oven to 450°F. Line a baking sheet with paper towels. Using a sharp knife, make shallow crisscross cuts into the cut sides of the eggplants. In a large pan, heat 1/8 inch of vegetable oil over medium-high heat until hot but not smoking. Working in batches to avoid crowding, carefully lightly fry the eggplant for 90 seconds on each side, then drain on the paper towels. Spread about 3/4 tablespoon sauce on the cut side of each eggplant and place it, cut side up, on a rimmed baking sheet. 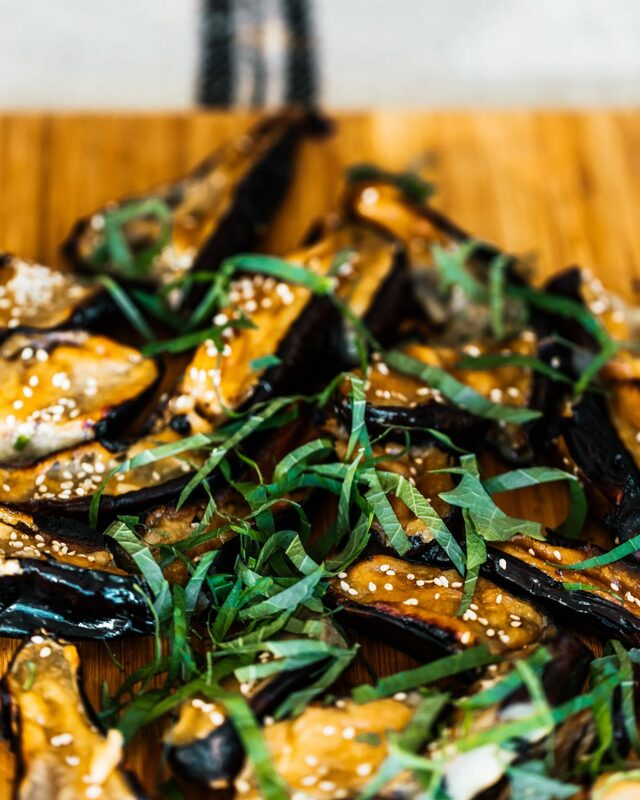 Roast the eggplant until tender and the miso has lightly caramelized, 10 to 15 minutes. Cut each half into thirds, sprinkle with shiso and sesame seeds, and serve.